Cute, cuddly, & playful, small animals make great pets for kids and adults alike. Whether you are looking for cages, hideouts, bedding, chews, feeders or waterers, Ware has your rabbit, guinea pig, Syrian/dwarf hamster, ferret, chinchilla, gerbil, rat and mouse needs covered. The Health-E Donut is a safe, fun chew for small animals. Chews keep teeth trimmed and provide a fun activity that relieves cage boredom. Supervision is recommended. The Health-E Schroom is a safe, fun chew for small animals. Chews keep teeth trimmed and provide a fun activity that relieves cage boredom. Supervision is recommended. The Loofah Salad is a safe, fun chew for small animals. Chews keep teeth trimmed and provide a fun activity that relieves cage boredom. Supervision is recommended. The Health-E Rabbit is a safe, fun chew for small animals. Chews keep teeth trimmed and provide a fun activity that relieves cage boredom. Supervision is recommended. The Health-E Cone is a colorful addition to a pets home. Helps pets with digestion and keeps teeth clean and trim. Safe hiding place for smaller pets like hamsters and mice. Supervision is recommended. 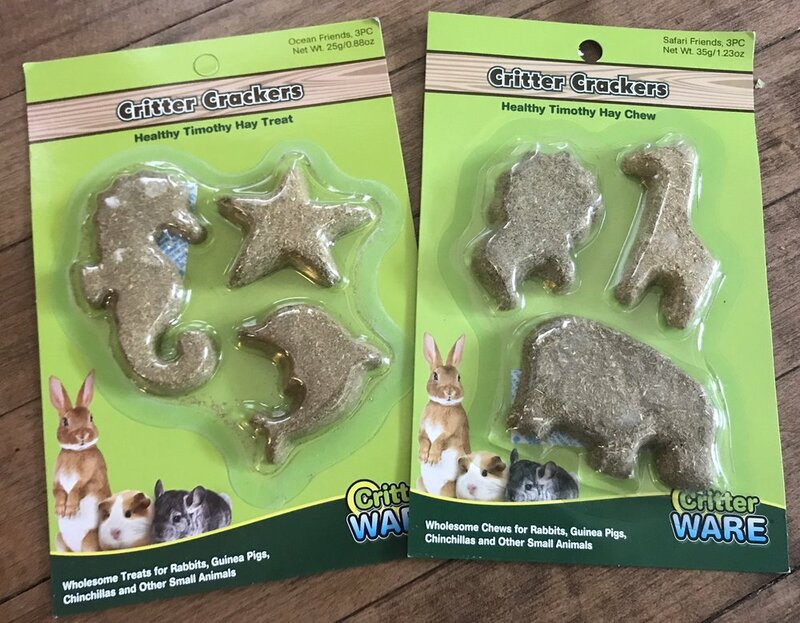 Ware Critter Crackers are compressed timothy hay treats that come in a variety of fun, animal-inspired shapes. These natural, high-fiber chew treats help with digestion and keep teeth clean and trim. Timothy hay is essential to your small animal's overall health. Chinchillas, guinea pigs and rabbits are plant eating animals requiring a diet rich in hay and grass. The Ware Chill Stone is a super cool place for your critter to rest. Soak the underside of the stone, refrigerate for 4 hours (do not freeze) and then place in your critter's home. The Ware Kapok line is a unique, two-in-one critter creation. Soft, kapok bedding, coupled with an easy to assemble toy. Two must have items for your furry friends! Remove the bag of Kapok from the cardboard backing and you will see instructions on how to turn the packaging into a fun toy! The Build-A-Nest is easy to construct -- just a few, quick folds and your toy is ready for use. Packaging is made with recycled materials vegetable based inks, so it is 100% safe to chew. The Ware kapok line is a unique, two-in-one critter creation. Soft, kapok coupled with an easy to assemble toy. Two must have items for your furry friends! 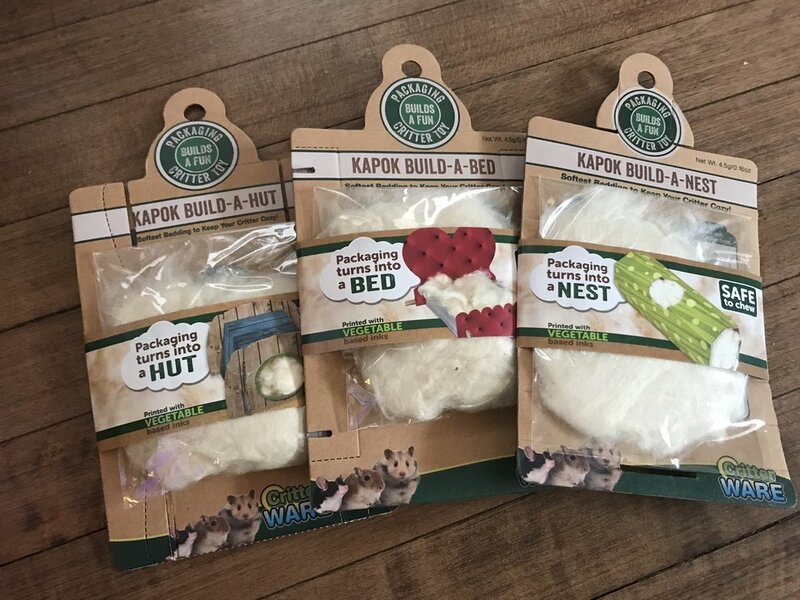 Remove the bag of kapok from the cardboard backing and you will see instructions on how to turn the packaging into a fun, critter toy! The Build-A-Bed is easy to construct - just a few , quick folds and your new toy is ready for use. Packaging is made with recycled materials and vegetable based inks, so it is 100% safe to chew. The Ware kapok line is a unique, two-in-one critter creation. Soft, kapok bedding coupled with an easy to assemble toy. Two must have items for your furry friends! Remove the bag of kapok from the cardboard backing and you will see instructions on how to turn the packaging into a fun, critter toy! The Build-A-Hut is easy to construct - just a few, quick folds and your toy is ready for use. Packaging is made with recycled materials and vegetable based inks, so it it 100% safe to chew.